For another test, the OSMU will be attached to a replicated section of the Orion service module on the simulator, and will experience the maximum velocity, up to 70 inches per second, during a launch simulation. The center’s Engineering Directorate is providing support to the Ground Systems Development and Operations Program for testing of the OSMU. This umbilical will be located high on the mobile launcher tower and, prior to launch, will transfer liquid coolant for the electronics and air for the Environmental Control System to the Orion service module that houses these critical systems to support the spacecraft. Engineers also will check the OSMU umbilical interfaces, hoses, and quick-disconnect plates for functionality. 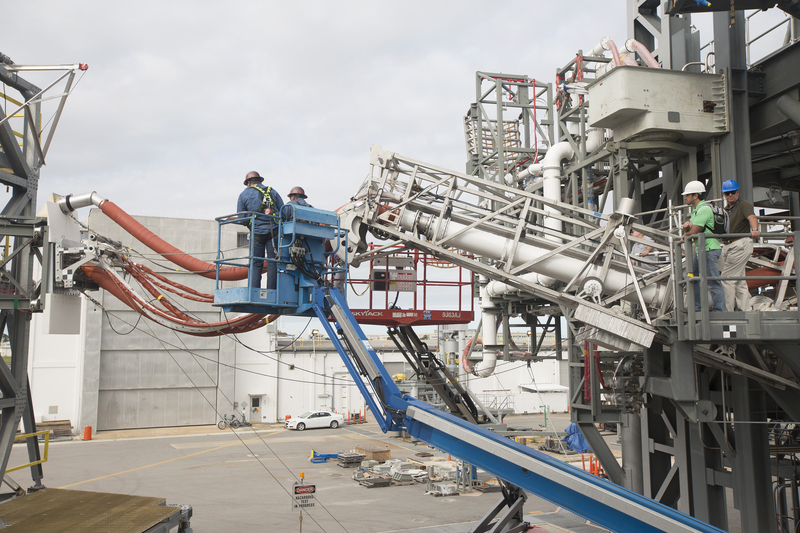 The tests will verify that the 15-foot-long umbilical will be ready for installation on the mobile launcher early next year and ensure that the umbilical will be ready to support launch of the SLS rocket and Orion spacecraft.